Everything Dinosaur’s press releases and other information. Everything Dinosaur have posted up a short video previewing the new for 2019 Schleich Diabloceratops dinosaur model. This video is more of a teaser for fans of prehistoric animals and dinosaur model collectors. In the video, we confirm the length of this figure (it is approximately sixteen centimetres long and those impressive horns are approximately eleven centimetres off the ground). Schleich Dracorex – a model of the “dome-headed” dinosaur Dracorex hogwartsia. The Schleich Dracorex measures nineteen centimetres long and the head height is around ten centimetres. Schleich juvenile Giganotosaurus – this figure has an articulated lower jaw and it measures around twenty-six centimetres in length and stands over ten centimetres high. Schleich Plesiosaurus – this marine reptile has a poseable neck and it is approximately sixteen centimetres long. The beautifully painted and very detailed head of the new for July 2017 Schleich Diabloceratops model. The Schleich Diabloceratops dinosaur model (available July 2019 from Everything Dinosaur). Dinosaur fans and prehistoric animal model collectors will receive a Diabloceratops (D. eatoni) fact sheet with every model purchased from Everything Dinosaur. Schleich will be introducing four new prehistoric animal models in July 2019. Today, we take a brief look at the only non-dinosaur figure to come out with this batch of replicas, the Schleich Plesiosaurus. It had been rumoured that the German-based model manufacturer intended to produce a plesiosaur and thanks to Everything Dinosaur, we can now post up a quick video preview of this model that will be in stock in the summer. New models being introduced into the Schleich prehistoric animal model range in July 2019. Foreground the new Plesiosaurus figure with a flexible neck, middle left the juvenile Giganotosaurus with an articulated jaw. Middle right the Dracorex figure and top left the new Diabloceratops model. In the top right, a Schleich Animantarx armoured dinosaur can be spotted, this figure was introduced in January. In the short video preview, a spokesperson from Everything Dinosaur comments on the unusual colouration on the top of the head of this figure, the dark blue markings have been described as looking like “goggles”, quite appropriate for an animal that spent much of its time under water. It can be speculated that these reptiles had good colour vision and their heads may have played a role in visual communication. Crests or horns on the head would have affected streamlining so such ornamentation is not known in the Plesiosauria, so perhaps subtle markings on the head could have helped signal the maturity of the animal and its fitness for breeding. 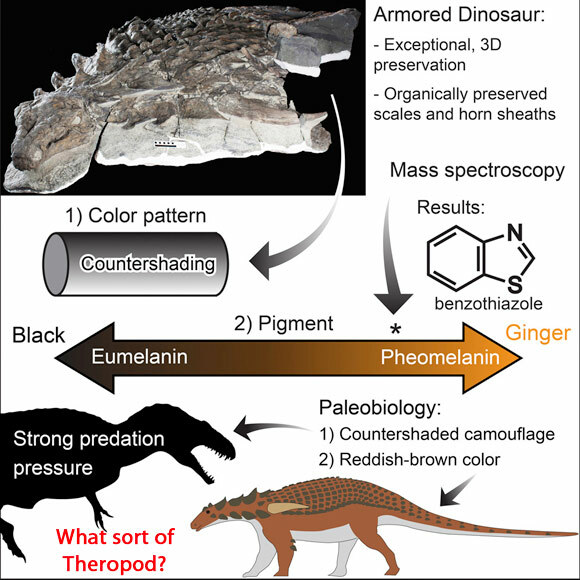 The overall colouration of the plesiosaur model is also discussed. The model is coloured a sky blue with flecks of white on the broad back. This combines well with a paler underside which represents countershading, a concept long linked with extinct marine reptiles and seen in many marine mammals today. The narrator in the video reflects on the fact that the colour scheme reminds him of polar conditions and states that as fossils of plesiosaurs have been found in high latitudes, such a colour scheme is appropriate as these reptiles are now known to have lived in cold waters. The Schleich Plesiosaurus model on display. As with a number of earlier plesiosaur figures, the Schleich Plesiosaurus has a flexible neck. This permits the neck to be placed in a variety of poses. When tested the neck is quite stiff and this allows the figure to remain in the pose chosen without the head drooping down. The Schleich Plesiosaurus will be in stock along with the three other figures (Dracorex, Diabloceratops and the juvenile Giganotosaurus), in July (2019). The new for 2019 Papo Spinosaurus dinosaur model will be available to buy from Everything Dinosaur in the summer of 2019. This awesome prehistoric animal model was revealed last week by the French manufacturer and this large dinosaur figure has already garnered a great number of positive comments given that it depicts Spinosaurus as a semi-aquatic quadruped, an ecological niche advocated in a ground-breaking scientific paper published on Spinosaurus aegyptiacus back in 2014. The new Papo Spinosaurus model will be coming into stock in June. Everything Dinosaur will be stocking the new limited edition Papo Spinosaurus in June 2019. The Spinosaurus has been kept under wraps by the senior management team at Papo, not even staff members at the company knew about the model’s existence until it was revealed at an exhibition last week. One of Papo’s best-selling dinosaur models of all time is their original Spinosaurus figure, but this model depicted this Late Cretaceous North African Theropod as a biped, many palaeontologists now believe that Spinosaurus was a specialised piscivore (fish-eater), that moved around on all fours and spent much of its time in rivers and lakes. The “classic” Papo Spinosaurus dinosaur model. The new Papo figure, will have limited availability, Papo intend to produce all the models in a single production run, so this new Spinosaurus will be much rarer and more difficult to obtain than the rest of the Papo “les dinosaures” figures. The Papo Spinosaurus (2019), will also be excluded from the 2019 catalogue, as Everything Dinosaur understands the situation, only a few selected distributors of Papo’s products will be able to gain access to this new replica. The awesome Papo Spinosaurus dinosaur model. Papo 2019 Spinosaurus dinosaur model. The new for 2019 Papo Spinosaurus dinosaur model. The new Papo quadrupedal Spinosaurus has a beautiful sail. Everything Dinosaur team members are preparing for the arrival in the next few weeks or so of the CollectA Supreme Deluxe Caiuajara pterosaur model. This beautiful and most impressive figure of a Cretaceous flying reptile from Brazil is going to be one of the first of the new for 2019 CollectA figures that arrive in our warehouse. As part of our preparations, team members have been busy researching and writing a fact sheet all about this weird and wonderful member of the Pterosauria. The CollectA Supreme Deluxe Caiuajara pterosaur illustration. This drawing will be used by Everything Dinosaur when they produce a Caiuajara fact sheet which will accompany sales of this amazing model. Large replicas of pterosaurs are becoming a bit of a CollectA speciality. When stocks of this 2019 figure arrive at our warehouse, it will be joining two other CollectA Supreme Deluxe pterosaur models. CollectA introduced a 1:4 scale replica of a Chinese member of the Ornithocheiridae family – Guidraco back in 2015. This was followed in 2017 by the award winning CollectA Supreme Deluxe Dimorphodon model. All three models will have moveable, articulated jaws. The Age of Dinosaurs Supreme Deluxe Caiuajara pterosaur figure with a moveable jaw. When this pterosaur was formally named and described back in 2014, it caused quite a sensation amongst palaeontologists who specialise in studying the Pterosauria. It is quite usual to have just a few fragments of bone to study, but in this case, the fossilised remains of more than forty individuals were recovered from a dig site in south-eastern Brazil. This flying reptile had a remarkable crest, shaped a bit like the wing of a butterfly. The fossil site was interpreted as a stop-over location as these animals migrated. They were very competent flyers travelling great distances, so it is appropriate that the new for 2019 Caiuajara figure is travelling a great distance from the factory to our UK warehouse. The fact sheet we are going to produce will also include a guide to pronunciation. The genus name of this pterosaur is pronounced “Kay-you-ah-jar-rah”. The CollectA Supreme Deluxe Caiuajara with moveable jaw measures around 19 centimetres in length and with that impressive and colourful crest the model’s height is about 23.5 cm. We look forward to welcoming this model into our CollectA portfolio. One of the great things about supplying dinosaur models and prehistoric animal figures to collectors all around the world, is that we get to examine the models in our warehouse before they get allocated space on the shelves in readiness for being purchased and dispatched. When a shipment of new models arrives, there is a lot of excitement around the office and whilst unpacking all the cases, we have the opportunity to examine up close and in detail the latest editions to Everything Dinosaur’s product portfolio. This week has seen the arrival of the eagerly anticipated Eofauna Scientific Research Giganotosaurus model in 1:35 scale. The model is beautifully detailed and we thought it fitting to make a short video of the articulated jaw, after all, the size estimate for this meat-eating dinosaur of around 13-14 metres in length was based on the discovery of some super-sized Giganotosaurus teeth. At the beginning of the year, we predicted that we would be adding approximately fifty new models to our already extensive range. That’s just about one new model every week. To read about our palaeontology crystal ball gazing and other predictions for 2019: Our Predictions for the Forthcoming Year. The Eofauna Giganotosaurus is the first dinosaur model to be created by this talented company. We knew about the introduction of this Theropod many months ago, when we met up with the senior management team of Eofauna Scientific Research, we even helped with the production of the text that accompanies this beautifully-crafted dinosaur model. We have added this figure to our own prehistoric animal model collection (we already have the two prehistoric elephants – the Steppe Mammoth and the Straight-tusked Elephant), we chose to create a short video just to demonstrate the skilfully sculpted skull and to highlight the model’s articulated jaw. The 1:35 scale Eofauna Giganotosaurus dinosaur model has an articulated jaw. Over the last few days we have been busy emailing all those people who had contacted us so that they could reserve a model. We have already received lots of amazing feedback and even seen some of video reviews posted up by our customers. We are already looking forward to the fourth model to come out from Eofauna Scientific Research. No doubt, details about this will be posted up on this blog site and on Everything Dinosaur’s social media sites in the near future. Eofauna Giganotosaurus model. The third prehistoric animal model to be created in this exciting replica range. Illustrations based on the three Eofauna replicas (left to right), Palaeoloxodon antiquus, Mammuthus trogontherii and Giganotosaurus carolinii.